Now let's discuss P2 Pets. P2 pets fight along side you, most have skills, and some can even be mounted and ridden! These pets level off experience, the same as your character. So the more experience you get, the more they get. Note: Unique pet names will be removed when you evolve your P2 pet, it is best to wait for renaming until your pet is the evolution you prefer. 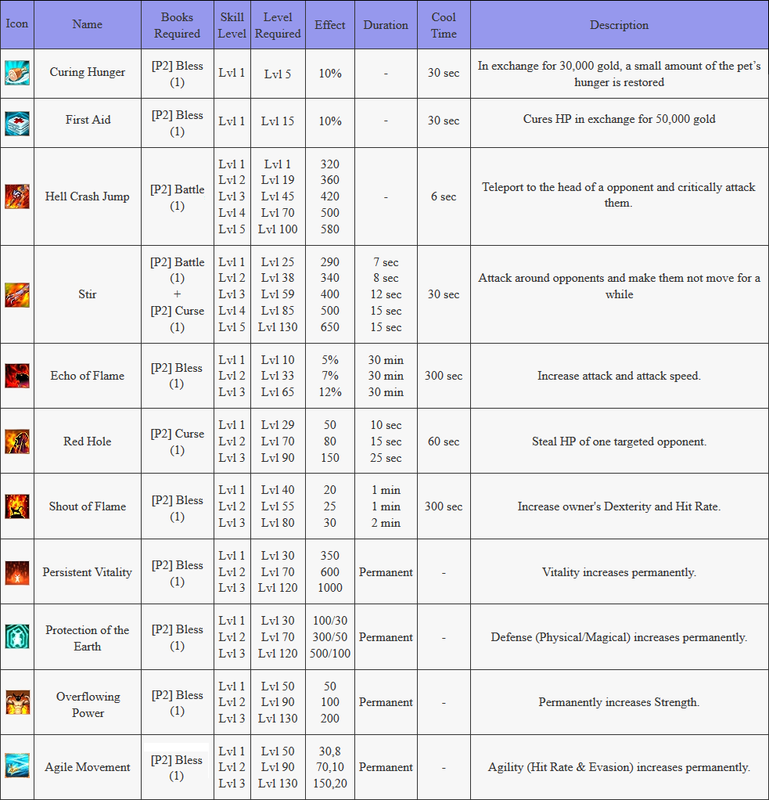 Note: P1 Pet FAQ can be found here. There are 3 types of P2 pets. Stage 3 will transform from rideable bat to demon form. This change will cause reset to AI. Can be stopped by using Abyss Anchor or Abyss Gas IM items. Can be attained through Torn Book of Life quest series or using book and Gems. What is the Popenia Vesuvia? It was once said that the Popenia Vesuvia was born of the ashes of Ulkan's Volcano to roam the lands of Iris with it's master. However it's possible to obtain one of these rare beasts with a pet leash. The Popenia Vesuvia is a P2 pet that has two evolutions. The first evolution has skills and the second evolution allows it to be mounted. What does the Popenia Vesuvia look like? My evolution 1 Popenia Vesuvia has skills, what do they do? 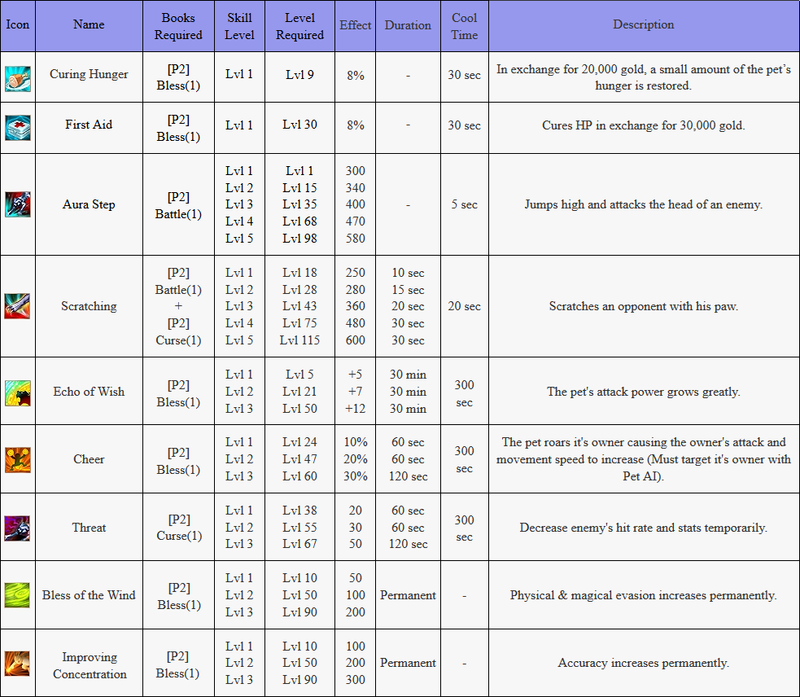 To get the skills for your Popenia you will need the proper books which you can purchase from Pet Merchant Polly. 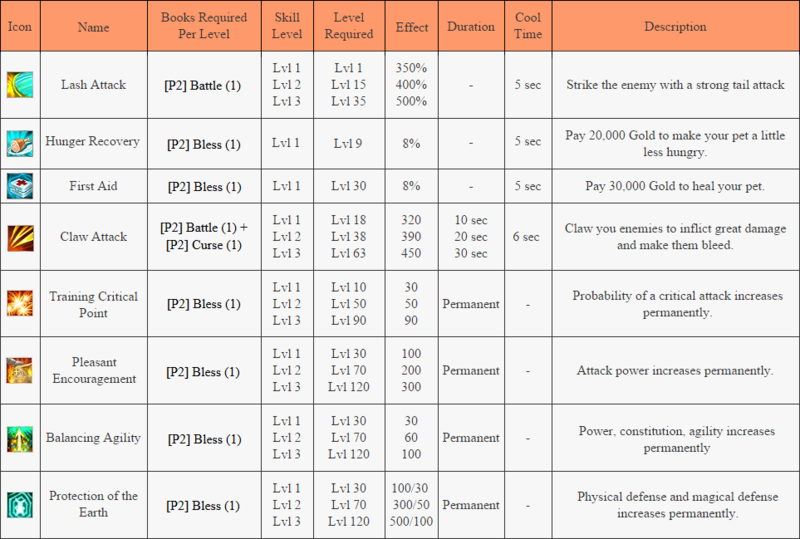 [P2] Battle books are used for attacks, [P2] Bless books are used for buffs, and [P2] Curse books are used for debuffs. On Bless of Earth in the effects category the number on the left indicates physical defense increase where the number on the right indicates the increase in magical defense. Does the second evolution of the Popenia Vesuvia do anything? Yes! The second evolution does allow you to use the pet as a mount! The pet will still fight a long side you, however it will not have any skills once it is evolved. This pet will not fight when you are on it mounted, when mounted it will change your movement speed to 17. There is no way to increase the speed, it's a fixed amount. What about armor or weapons for my new Popenia Vesuvia? You can use armor on both evolution 1 and evolution 2 which will help it fight along side you! Claws or Teeth for its weapon, Aura and Charm for it's armor. 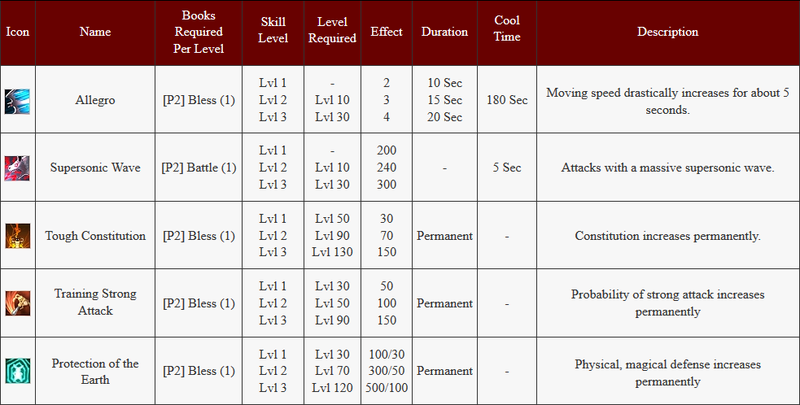 However, make sure that these are Animal Type and for the correct level otherwise your pet will not be able to equip it. You can purchase the Claws/Teeth, Aura, and Charm from Pet Merchant Polly. Is the Popenia Vesuvia trade-able? Yes. The leash and both evolutions of this pet are trade-able. A jaguar is a P2 pet on Last Chaos. This P2 pet has 3 evolutionary stages and can buff its owner! Like all other P2 pets, the Jaguar can fight alongside you and caps at level 165. How do you get a Jaguar? To obtain a Jaguar you must first obtain a Jaguar Leash. They are currently only available from special promotions in our Item Mall. However, it is possible you may be able to purchase the item from other players. Once you have obtained this item you must go to Lorraine in Randol and show her the collar, she will give a quest to obtain a jaguar cub. All Jaguars start off as a Jaguar Cub at level 1 when they are received from completing the quest. It then can evolve to a Jaguar at level 50, but once it evolves it will reset to level 1. When the Jaguar reaches level 50 it can evolve into a Panthera Onca, which it will start off at level 1 again. This is it's final evolution. How do I evolve the Jaguar? To evolve a jaguar: Take it to the pet trainer, then select the "Evolution" option and drag the jaguar once it level 50+, then confirm. What skills does it have? No, the Jaguar pet can not be mounted in any evolution. What armor & weapons does it use? Jaguars use Teeth or Claws (not both), an aura, and a charm. You can pick these items up at Pet Merchant Polly. Make sure that the items you purchase are ANIMAL type and that they are the correct level for your pet. Yes the Jaguar pet is trade-able. A succubus is a demon type P2 pet. This P2 pet is more complex than a few of our other pets. It has three stages of evolution, but their evolution can be dependent on their hunger or sincerity. Like all other P2 pets the Succubus can fight alongside you and caps at 165 like all other pets. What does the Succubus and all of its forms look like? How do you acquire a Succubus? A succubus can be purchased from other players or can be purchased from the item mall as the item of a Goat's Head. Succubus is considered its final form, it has two stages before it can become a succubus as it appears in the chart. When you first complete the quest from Lorraine you will receive a strange bat. How do I evolve my Strange Bat/Demon Bat? To evolve your strange bat you must level it up to 50 then take it to the animal trainer. When you open up the animal trainer interface select evolution then drag and drop your bat into the field provided. When it evolves it will reset to level 1 but it will be at the next evolution. A succubus being it's final stage of evolution. 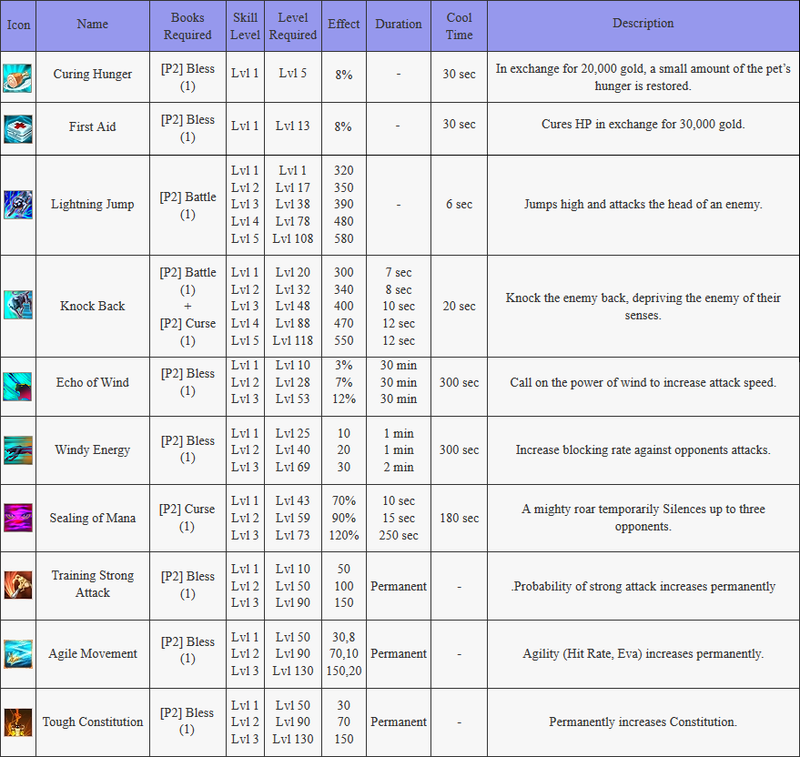 Please see the evolution chart above for information on how to get different types of the succubus. Can the Succubus be mounted? Stage 3: Only when she is in bat form. Why is my Stage 3 Succubus a bat? The succubus will switch between being a bat and being a succubus. There are items that you can purchase in the item mall to keep the succubus from switching between the two for a short period of time. The Abyss Anchor will keep your succubus in her succubus form and the Abyss Gas will keep your succubus in her bat form for her to remain a mount. What equips does a succubus use? Succubus' equip Claws, wings and tattoos. Make sure that the equips you purchase are for DEMON types because she is a demon type pet. Yes, all evolutions are trade-able. The Kangaroo, or Kanga-Yumpa has arrived! This pet will pick up your items, without needing to use the AI system. It will also be able to store some of your items for you as he picks them up. The higher you level him, the more items he can carry for you! He starts off with 5 spots open. He can get up to 25 open (at this time) as you level him. He can be hit by monster and players, so be sure to watch his health and make sure to update his gear. He has no AI system. He cannot evolve at this time. Be sure to get yourself a Kanga-Yumpa today and trust him with some stuff! This cat was tracked and brought back from the highest snow covered mountain in Ascadia. He might look like a normal Leopard, but he is special. Check it out! Evo 1 is called the Snow Kitten, she works just like a normal Leopard EXP pet. Evo 2 is called the Snow Leopard, her cooldown is lessened and she holds MORE EXP! She evolves at level 165.